With every step you take, your knees not only bend and straighten but also bear the weight of your body. The knees usually accomplish these tasks without symptoms, but this is not always the case. Pain provoked by straightening your knee can arise from acute injuries or chronic disorders affecting numerous structures in and around the joint, including cartilage, tendons, ligaments, bursae, muscles, bones or the synovial membrane. Each knee contains two small pieces of rubbery cartilage called menisci located deep within the joint. They act as shock absorbers between the two main bones of the knee -- the femur, or thighbone, and the tibia, or shinbone. The medial meniscus resides on the inner side of the knee, and the lateral meniscus on the outer side. Meniscus tears are common injuries, especially during sporting activities. They also occur in older individuals, as the menisci thin and weaken over time. Pain while straightening the knee is often present with a meniscus tear. Knee swelling may occur, especially with tears caused by an acute injury. Part of the torn meniscus sometimes catches between the bones, causing locking of the knee. Articular cartilage covers the surface of the femur and tibia, enabling the bones to move smoothly during knee movements. 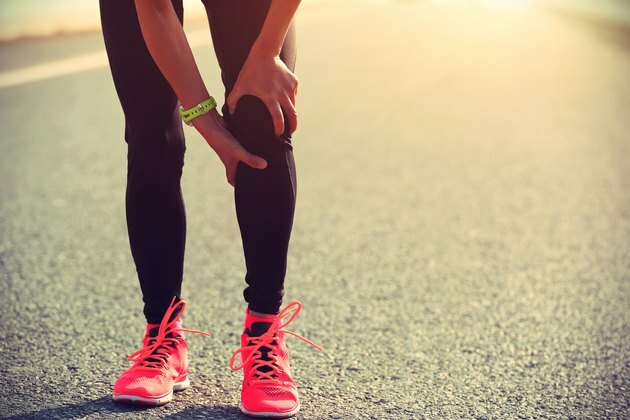 Over the course of decades, repeated knee movements that occur with everyday activities might eventually damage the articular cartilage and lead to osteoarthritis. As the cartilage wears away, the underlying bones come into direct contact, causing pain and a grinding noise or sensation with knee movement. Joint swelling and stiffness occur due to accompanying inflammation. Knee deformity often develops with severe osteoarthritis. Articular cartilage also covers the back of the kneecap, or patella, and the trochlear groove, the depression at the lower end of the femur through which the patella travels as the knee bends and straightens. Chondromalacia patella, or runner’s knee, occurs when the patellar cartilage is damaged. This condition frequently occurs in amateur and professional athletes due to repetitive knee movements. It is more common in females, runners and people with patellar misalignment that prevents the kneecap from moving in the center of the trochlear groove. Pain occurs with knee movements, including straightening, and after prolonged sitting with the knee bent. Tendons are strong bands of fibrous tissue that connect the ends of muscles to bone. The quadriceps tendon attaches the quadriceps muscles in the front of the thigh to the upper part of the patella. Damage to the tendon can occur with repetitive knee movements, especially jumping and climbing stairs. Chronic damage and inflammation produce quadriceps tendinitis, or jumper’s knee, which triggers pain when straightening the knee. Less often, the quadriceps tendon partially or completely ruptures, causing sudden severe pain. With a complete rupture, the knee cannot be straightened without assistance. The patellar tendon joins the lower part of the patella to the tibia. Despite its name, the patellar tendon is technically a ligament because it joins two bones. Repetitive knee movements can inflame the patellar tendon, resulting in patellar tendinitis and pain when straightening the knee. The term jumper’s knee may also be used for this condition, as it is produced by the same movements as quadriceps tendinitis. Infrequently, the patellar tendon ruptures partially or completely, like the quadriceps tendon. Ligaments are tough bands of fibrous tissue between bones that keep joints in proper alignment. Four ligaments support the knee. The anterior cruciate ligament (ACL) and posterior cruciate ligament (PCL) are located deep within the knee joint. The medial collateral ligament and lateral collateral ligament reside on either side of the knee joint. Knee ligaments can be overstretched, resulting in a minor sprain or actual tear. This is usually caused by an acute injury, such as a sudden knee movement or a direct blow to the knee. Less commonly, sprains or tears are caused by wear and tear from repetitive knee movements, particularly in older adults. Damage to knee ligaments may produce pain with knee straightening, especially if there is accompanying knee swelling. Instability, with the knee giving way, occurs commonly with ligament injuries. A pop or snap may be heard or felt when a knee ligament tears. Significant swelling typically develops quickly after ACL and PCL tears due to bleeding within the knee joint. Bursae are sacs containing a small amount of fluid that separate movable structures like tendons, ligaments and muscles from each other or surrounding bones. They cushion movable structures, protecting them from undue pressure when in motion. With repetitive movements, the amount of fluid in a bursa increases and inflammation occurs, resulting in bursitis. Eleven bursae reside around the knee. Some, like the deep infrapatellar bursa located underneath the patellar tendon, cause pain during knee straightening when they are inflamed. A Baker cyst is a fluid-filled sac behind the knee. It is usually formed by the bursa between the gastrocnemius muscle of the calf and the semimembranous muscle at the back of the thigh. But it may also arise as an outpouching from the fluid-filled knee joint itself. Large Baker cysts often accompany severe knee arthritis and produce pain when the knee is straightened or fully bent. Strains or tears of muscles that run behind the knee, such as the hamstrings or popliteus, commonly provoke pain when they are stretched during knee straightening. A fractured patella produces pain, swelling and bruising around the patella, and attempts to straighten the knee can worsen the pain. This injury is usually caused by a direct blow to the kneecap. A fracture at the upper end of the tibia that extends into the joint -- a tibial plateau fracture -- can also cause pain with knee straightening and other knee movements, as well as with standing. Knee swelling can be severe with this injury, as bleeding occurs inside the joint. Inflammation of the synovial membrane -- the tissue lining the knee joint -- is characteristic of inflammatory arthritis, such as rheumatoid arthritis or gout, or infection in the joint. These conditions produce constant knee pain that often worsens with knee movements. Knee swelling and other signs of inflammation or infection, such as redness and warmth, are generally present. If you experience recurring pain when attempting to straighten your knee, see your doctor to determine the cause and appropriate treatment. Seek urgent medical attention if your knee is warm and red, especially if you also have a fever as this may indicate an infected joint. If you sustain an acute injury to your knee, seek immediate medical care if you are unable to walk, cannot bend or straighten your knee, or have severe pain, a deep wound or significant bleeding. Also seek urgent medical care if you notice a pop or snap during the injury or your knee appears very swollen or deformed. Functional Soft-tissue Examination and Treatment by Manual Methods, 3rd Edition; Warren I. Hammer, D.C.
American Academy of Orthopedic Surgeons: Patellofemoral Pain Syndrome. Decision Making in Medicine, 3rd Edition; Stuart B. Mushlin, M.D. and Harry L. Greene II, M.D. Essentials of Physical Medicine and Rehabilitation: Musculoskeletal Disorders, Pain, and Rehabilitation, 3rd Edition. ; Walter R. Frontera, M.D., et al.